A water bath capable of holding 25±0.1°C is required for the Viscomat. The bath should have external cisculation in order to maintain a reliable flow through the Viscomat. All water baths delivered by Lagge are recirculating heated baths complete with a thermostat unit with external circulation and a water bath container. 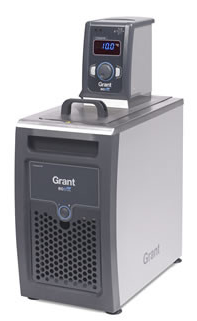 Our standard thermostat unit is the Optima TC120 from Grant Instruments Ltd., Cambridge, England. This thermostat is designed for ease-of-use, stability, reliability and energy efficiency. It has powerful pumping and heating capacity for closed loop applications such as in the Viscomat application, and is an economical choice offering solid performance for applications ranging from -25°C to +140°C. The water bath container is selected based on the the cooling requirements and the number of samples required to fit into the bath. The non-refrigerated water baths from Lagge are shipped with a tap water cooling coil, since the 25°C required by the viscosity method usually is close to the ambient room temperature 1, especially during warm summer days. TC120-ST12: This is our standard water bath Temperature range +20°C – 100°C with tap water cooling, complete with external circulation for connection to the Viscomat II and tap water cooling coil. Volume: 12 liters. Material: stainless steel. This bath has a minimal footprint (360 × 335 mm) and still room for at least 8-10 viscosity samples in the 12 L container. LT ecocool 100: Temperature range -10°C – +100°C, complete with external circulation for connection to the Viscomat II. Capacity: 5 liters. Material: stainless steel. This is a refrigerated bath which means that it can keep the water temperature at 25°C without requiring tap water cooling or a separate immersion cooler. All water baths can be delivered with a raised platform and holders for keeping the 50 mL sample bottles in place. Please contact us for more information. For more details, additional configurations and add-ons, download the pdf brochure. 1 A thermostat like the TC120 requires at least 2-3°C difference between the ambient room temperature and the set temperature to work properly, ie. if the room temperature is above 22-23°C, cooling is required.